Electrical Hazard Protection meets ASTM F2892-11 standards. Steel Toe meets ASTM F2412-11 and F2413-11 I/75 and C/75 standards. 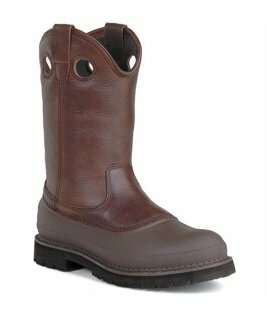 Comprised of brown full-grain leather on the upper, this boot has a great deal of durability. The molded TPU shell is waterproof and protects this footwear against abrasions. This boot shields feet from harm and has been tested to standard.